After a few stitches and a cinched belt, I thought it was perfect! Aside from the shocking pink color, the dress caught my eye because it reminded me of paintings by Que Houxo, a Japanese artist who works with fluorescent paint and blacklights. 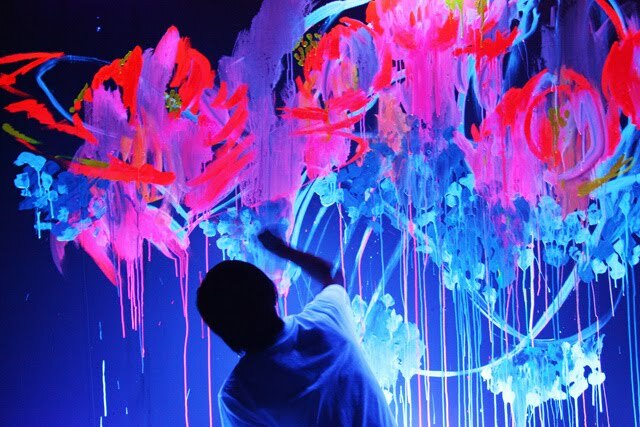 His paintings are beautiful on their own, but under the blacklight, they gain a whole new dimension. I first discovered his works when he designed the display windows for Topshop. 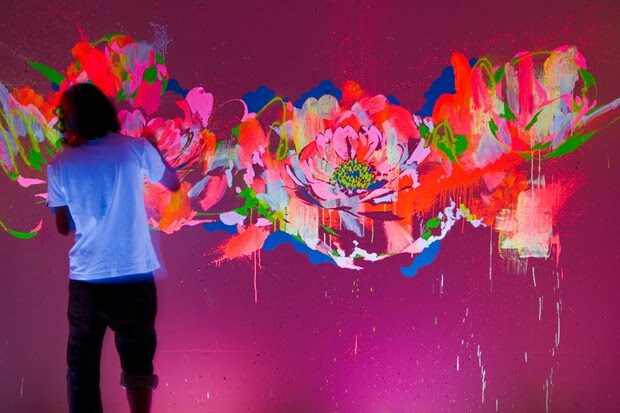 This dress definitely captures the contrast between sweet florals and oversaturated neons, as seen in Que Houxo's work. These are my favorite summer shoes, but I think they're great for fall, too, with socks. I'm wearing a vintage dress and belt, J. Crew socks, and Johnny Wujek for Modern Vintage shoes. Thanks to Whitney Marie for the lovely photos! is there anything you can't pull off, ariel?? :) i love it...esp the contrast of bright colors with the fall leaves! the colors are glorious. love the dress, love the fluorescent painting too! lovely neon trees! That dress is unbelievable! Obviously a good color. my love for you just reached a whole new level. I love the first picture and the plié. Adorable! Nice blog you have here. Come and visit mine when you have time. Perfection! the dress is stunning and I love the shoes. gorgeous gorgeous gorgeous! I love the dress, the colors are amazing! Great!